The story follows Wilson as he attempts to find his place in Hungarian society in his daily life. 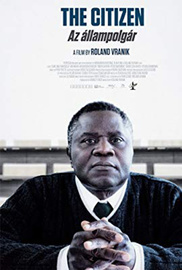 In his late fifties Wilson, whose family was killed during an outbreak of civil war in Guinea-Bissau, enters Europe as a political refugee and settles for a sedate life as a security guard in a Budapest shopping center. Wilson's main desire is to acquire Hungarian citizenship. The story follows Wilson as he attempts to find his place in Hungarian society in his daily life, at work, with Mari, a history teacher who helps him study for the citizenship and Shirin, a young Iranian woman whose only hope to avoid deportation is to marry a Hungarian citizen. The Citizen is an Award-winning drama that poignantly dwells on some of the most complex issues of contemporary modern European society.